A few months ago, there were a lot of articles on the topic like "10 Ukrainian groups you do not feel shame of" or "20 performers, who restored the faith in the Ukrainian music" written by the representatives of the national media. It was easy to notice that all these journalists have used the same names in their lists. Noizr Zine decided to remind about the bands whose releases are welcome instances in foreign music collections, but which aren't well-know among the majority of Ukrainians. Kharkiv-based band, which celebrated its 20th anniversary last year, has in the asset six full-length releases, cooperation with foreign labels and many concerts at the international festivals in Finland, Lithuania, Poland, Latvia, Czech Republic, France etc. Nokturnal Mortum is a cult group in its genre (folk pagan/black metal), and even in Ukraine draws a big crowd of fans. While the Norwegian politicians memorize the names of the local black metal bands and sponsor their performances with symphony orchestras (with the next broadcast on TV), Nokturnal Mortum, despite all its achievements and recognition abroad, remains unknown underground group at home. Another Kharkiv band, which is popular among foreign music lovers. Drudkh used for songs its own lyrics and verses of the Ukrainian poets. Some group's albums are fully dedicated to the works of one writer, for example, "The Swan Road" — Taras Shevchenko, "Estrangement" — Oleg Olzhych. Also, in the band's releases you can hear poetry of Lina Kostenko, Vasyl Stus, Ivan Franko, Oleksy Stefanovic, Nikolai Vingranovsky and many other Ukrainian classics set to black metal music. Currently, Drudkh has signed with the famous label Season of Mist. Its last's album "A Furrow Cut Short" release was widely reported in major thematic editions, from the American Metal Injection to the legendary German Metal Hammer magazine and the British Terrorizer. Somebody may says that the group is not so well-known at home because it's only a studio project who had never performed live. But what prevents to include it in the list of bands "you do not feel shame of" and broadcast on radio? Editors and journalists may say "this is not our format". Well, meanwhile, we include Drudkh's "formatted" entirely instrumental album "Songs of Grief and Solitude" in our list. It's the Ukrainian must-have of music collections with concerts abroad, reviews in Metal Hammer magazine and publications on major news portals. Khors as well as Nokturnal Mortum, in spite of almost zero PR in the Ukrainian media space, known and appreciated by native music lovers. The band stands out by its thoughtful stage image, and probably the most massive decorations, which became a kind of feature at the group's performances. The Russian-Ukrainian project formed by musician Anton Belov in Chelyabinsk in 2005. At the moment, the group is based in Kyiv and its line-up (which earlier has few changes) also includes four Ukrainian musician. Kauan is an atmospheric embient/doom metal music with keyboards and bowed string instruments. The lyrics of its most releases written in Finnish, except of few songs on the album "Tietäjän laulu". 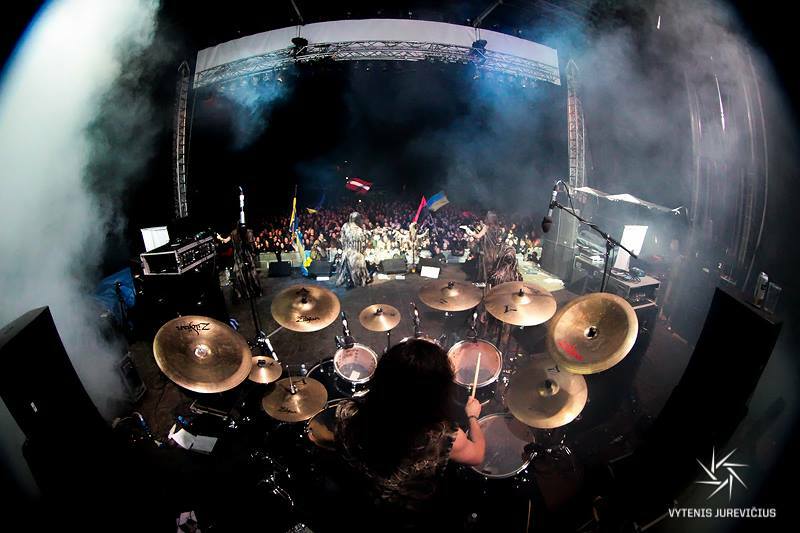 Ukrainians could see Kauan at the Rock Sich's main in 2013, also as the headliner at the Shades Of Solitude concert and at the thematic Doom Over Kiev festival, where the musicians are to perform again, on the 7th of November. Growling, roaring guitars and powerful blast beat of black metal, video clips with half-naked girls dance to energetic black'n'roll played by musicians in corpse paint and a typical electro pop rock with the sweet-voiced singers — all of this can be heard in the band's 11-year discography. Semargl is a group without restrictions and genre limitations which has had concerts in Poland, the Netherlands, Lithuania and Estonia, cooperation with international labels, publications in major publications and collaborations with other musicians: Tyler Milchmann, Johnny Modling (ex-My Dying Bride), Nera (Darzamat), Novy (ex-Behemoth, ex-Vader), Iscariah (ex-Immortal) and Vrangsinn (Carpathian Forest). Due to its various music and numerous provocations, Semargl is known not only among metalheads, but also ordinary Ukrainian listeners. The reason for this popularity was also the participation of a guest vocalist Irina Vasilenko (in Semargl — Adele Ri) on the show X-Factor, in particular. However, during the live broadcast STB producers presented Vasilenko only as a singer of the rock band Mysterya and never mentioned her more higher quality and successful project. The information about Irina's featuring in Semargl became known only after her leaving the show. Therefore, our media is not ready to deal with the scandalous groups as MTV with the show "The Osbournes" or TVP 2 with "heretic" Adam Darski, whio was a judge on "The Voice of Poland". Radio ROKS has told about Semargl several times via its website, but its songs do not broadcast permanent even there. Time will show whether the situation change for the better in respect of this and other groups in Ukraine.